Is it possible for two very different teenagers to fall in love despite high barbed wire fences and a political wilderness between them? Anahita is passionate, curious and determined. She is also an Iranian asylum seeker who is only allowed out of detention to attend school. On weekdays, during school hours, she can be a regular Australian girl. Jonathan Do is the biracial son of an Australian mother and Vietnamese immigrant single father, living within the parched landscape of Darwin in the Northern Territory. Jonathan disinterested in his education and preferring intoxication rather than accountability, choosing to isolate himself from his estranged mother living in Sydney. The relationship Jonathan shares with his father is distant and impersonal, preferring the company of Minh, Dzoung's sister. After the collapse of his relationship with girlfriend Priya, Jonathan became increasingly depressed, his father now concerned is the cause of Jonathan's destruction. Anahita Shirdel is an Iranian asylum seeker at Wickham Point Detention Centre, previously located on Nauru and Manus Island. Wickham Point is a fortress to asylum seekers from Burma, Afghanistan, Iran, Vietnam and New Zealand, pregnant women and children have been transported to Darwin without their partners, the Australian Human Rights Commission convicting the centre as inhumane, ignored by the Australian government. Anahita's mother is pregnant to partner Abdul who remains on Manus Island, transported to the mainland after being diagnosed with preeclampsia along with Abdul's son, three year old Arash. Anahita is a beautiful young woman, gentle and compassionate. The devastating conditions experienced in Iran have left Anahita traumatised, overwhelmed by nightly terrors. Australia offered an opportunity of freedom and safety, now left behind the cyclone fence and kept in oppressive, inhumane conditions. Dzoung Do is a guard at the regimented detention compound, his narrative often confronting and intolerant. Dzoung is a Vietnamese immigrant, sponsored by his sister Minh to journey to Australia, marrying an Australian citizen and forgoing his traditional Vietnamese heritage. Determined to integrate into western society. Dzoung initially facilitates the friendship between Jonathan and Anahita, as Anahita begins her education at the local secondary college. The guards at the Wickham Point facility are often cruel, some regarding those seeking asylum as subhuman. Dzoung is an infuriating character, judgemental and increasingly without compassion. He allowed his own moral compass to be poisoned by the racist, bigoted employees at the Wickham Point facility. The tentative friendship between Jonathan and Anahita is gentle and compassionate. Jonathan allowed Anahita to set boundaries within their friendship concerning her personal and cultural principles. Although Jonathan continues to experience casual racism, Anahita's peers are considerate and courteous. Friend Zahra's journey to Australia is indicative of the harrowing journey made by asylum seekers. Boarding substandard transport with family members often lost to the treacherous conditions. The plight of asylum seekers is a precarious discussion for Australians. Men, women and children journey to Australia in dangerous conditions only to be denied basic human rights. They are detained behind cyclone fences in remand compounds on Nauru or Manus Island. Those granted refugee status will never be afforded the opportunity of freedom, treated inhumanely and exposes vulnerable asylum seekers to sexual, physical and psychological abuse, withheld in indefinite detention. Clare Atkins is one of Australia's finest young adult literature authors. Between Us is a passionate conversation of Australia's inhumane treatment of those seeking asylum, reminding us of our understanding and our compassion. Compelling and influential reading. Yes to diverse OZYA! This sounds like such an amazing and important read especially with all the stuff that has been happening with the asylum seekers over the past few years. This one is going straight onto my tbr list! It's such an important and timely read Lara, it's an issue that will always be a point of contention. It gives a fictional face to an issue that so many Australian's refuse to acknowledge as well. I can't wait to see what you think of it! Oh wow, this sounds absolutely lovely. It's such an intriguing and important topic. Thanks for sharing - I hadn't heard of this one! I say it all the time, but I really want to read more Aussie fiction. You all seem to do really well with diversity, which is great. I feel like the U.S. is finally getting there. Anyway, thank you for your great review! These characters sound fascinating. Australian's authors are wonderful aren't they! This will no doubt be one of my favourite reads for the year Lauren. I love books that bring to light social and political issues, it's so important as a community to have these discussions. This sounds magnificent! Why am I just now hearing about it? It seems so relevant to what's happening in the world today. Does Jonathan get over his "casual racism," or does he struggle with that the entire book? I've noticed that there are a lot of people that don't think they are being racist, when they very clearly are. It's the environment they've grown up in, so they don't see small slights as the big offense they are. We need to be better and more aware as people. Racism, whether casual or outright, is disgusting and unnecessary. People are people. Lovely review! Thanks for sharing this one. The casual racism he experiences doesn't seem to bother him, which is telling for our societies that racism is an issue that's widely accepted. It's an issue that Australia in particular needs to also address. I've been guilty of it myself because it's almost as though it's ingrained in us through our peers and even parents growing up. I'm much more mindful of it now because even casually, it causes offensive and harm. Wow, this book sounds immense. The kind which is filled with issues and deeper questions and definitely one which will shine a light on everyday racism and small actions which are meaningless to some and means a lot more to others. Definitely an appropriate theme for a book. It sounds really good. It's magnificent Becky, one of the best #LoveOzYA books I've read thus far. Although the characters are fictional, the detention centre is not and that realism only highlights the Australian government neglect of basic human rights for those seeking asylum. Powerful reading. PS. I have nominated you for The Versatile Blogger Award! It's in my latest post! Thanks Charlotte, that's really lovely of you. Will check it out soon! It's an incredible read and one I urge everyone to read, not just Australians. The mistreatment of asylum seekers is a global issue and I love that books like Between Us can impact on readers to find out more about what their own governmental policies are about those seeking refuge. It's not something we see discussed often unfortunately. wow that is wow, did not know that this was happening. I am assuming it is if the book was written in a way that seems to strike compassion and awareness. It looks so heartbreaking, but well written. It does and it's also hopeful. Anahita is such a wonderful character, the trauma she's experienced and yet she still appreciates the live she's been given. It really struck a chord with me. How many refugees escape their hostile and war torn countries only to be placed in detention. Australia's policies are horrific, the law now is that anyone arriving by boat will never be granted citizenship in Australia. They process asylum seekers offshore in inhumane detention centres where they are forced to live or return home. We've truly lost our humanity. Whew. This sounds confronting and heartbreaking, and more books like this should be compulsory reading I think. I couldn't agree more Verushka. 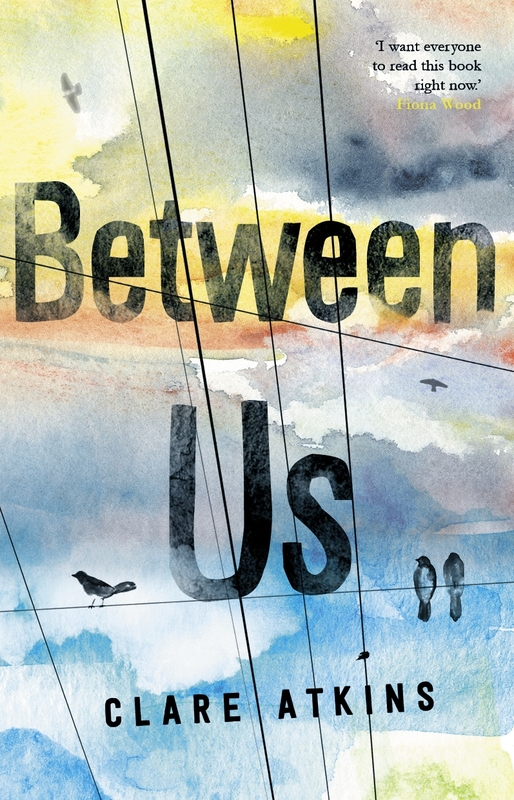 Between Us should be part of the school curriculum or at the very least, in every library and school library. #LoveOzYA has been magnificent this year, strong social and political themes really highlight how in touch our authors are with the political climate. I couldn't recommend this more highly. We have this one coming up for OzYAY coming up in March and I'm looking forward to reading it! It sounds like such a wonderful, topic discussion. Glad to hear you enjoyed it Kelly! It's incredibly confronting but such an important story to tell. Really looking forward to listening into the discussion. oh the thought of the mistreatment still makes my blood boil! Definitely a book school children should be exposed to and get the conversation going! It's certainly rage inducing Ailyn. Such an important and influential read. This sounds amazing. And maybe even a good book club nomination. I have book club tonight so I was looking for something discussion worthy. So glad you loved this one! The world is making me sad Kelly. So many powerful reads but they remind me of how far we still need to go.